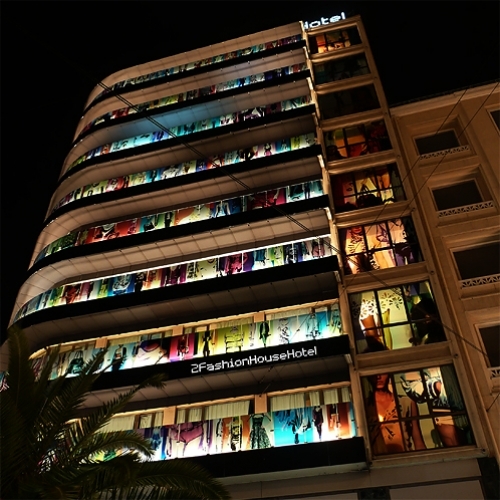 Created for Athens’ 2FashionHouseHotel, this permanent artistic installation comes wrapping up the façade, enlightening it through a series of fashion shots – reworked graphically using saturated colours. Resembling a photographic lay-out, the installation covers the façade in two different ways : the first part looks like a semi-transparent frieze that runs over the balconies. Light sensitive they react - like a photographic slide - to the neon tubes set at the bottom of each guardrail. The second part corresponds to two huge compositions applied onto the rooms’ windows. Revealed up by the ambient inside the rooms, they create two vertical columns at each end of the building.